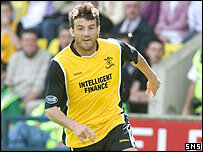 Livingston striker Ramon Pereira has cut short his stay at the West Lothian club to return to his native Spain. The former Hearts forward arrived at Almondvale in July and scored two goals in 14 appearances this season. A Livi spokesman told the club website: "Ramon has personal reasons for his decision to return home, and we agreed to his request. "Paul Lambert intends to strengthen the playing squad when the transfer window opens. We wish Ramon all the best."